I’m really glad I’ve started taking daily walks. Ok, so I sound like a 65 year old woman, but it was on my very first such ‘constitutional’ that I spotted Sub-Station, a cute (but sadly closed that day) little cafe in Alexandria. I told my man-friend about the place and he beat me to it that very week, getting the inside scoop via his charming personality (note to self: get a charming personality). 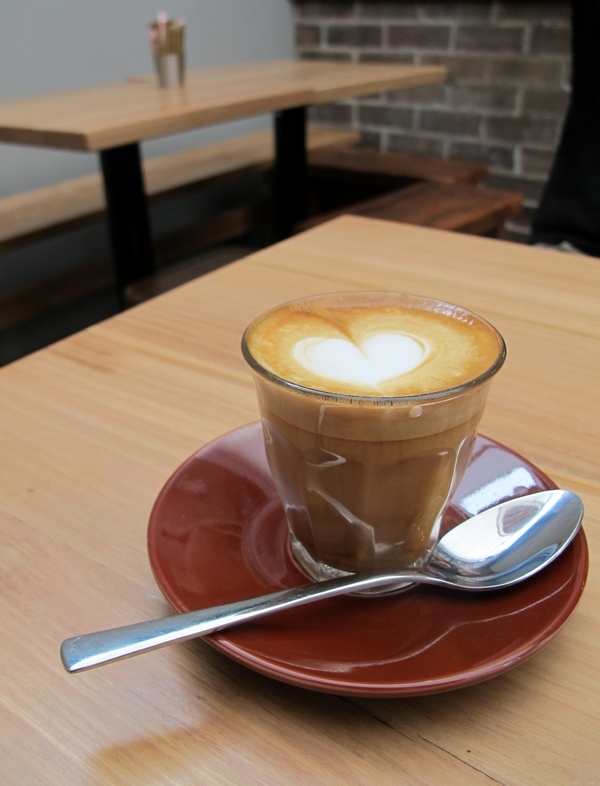 Sub-Station Cafe opened just over a month ago in, you guessed it, Alexandria. It is housed in a beautifully renovated electric substation (Substation 152), a long narrow space with a fantastic indoor/outdoor area, warmly minimalist with a homey touch. The attention to detail in the decor is to be admired, from the patina of the floor to the bare bulb light fittings crafted from bedsprings. Sub-Station has a spotlight-on-the-ingredients kind of café menu. 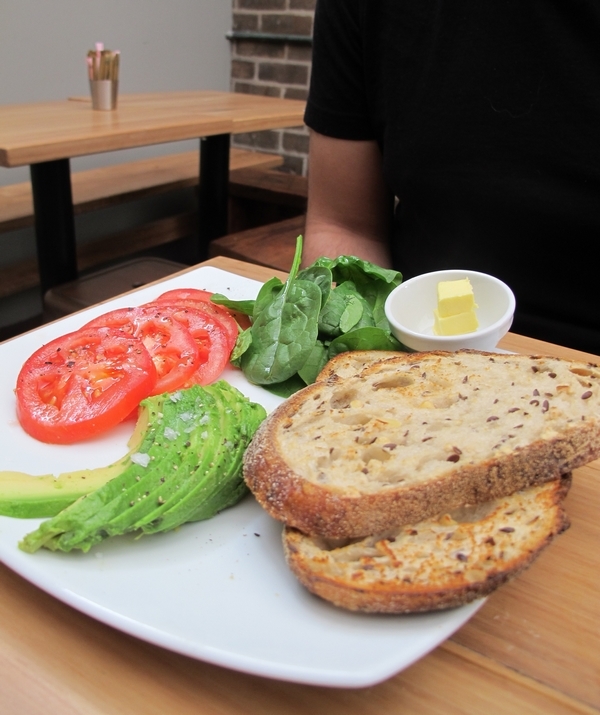 We ordered the Avocado Toast to share which was a generous plate of soy and linseed toast and seasoned fresh tomato and avocado. I like the diy approach, which is the same for their big breakky, a kind of platter of various toast toppings plus eggs. They also have a lunch menu of sambos and salads. It’s all very simple, fresh food, assembled more than cooked, that seems to be all the rage right now in Sydney, especially at bakeries or coffee obsessed cafés. Personally I am a fan of this kind of menu as there’s only so much candied bacon I can take. Either their single origin house blend is amazing or they have an amazingly skilled barista on staff (you never can tell). Case in point my man and me had not one criticism to make in terms of either flavour or form. After three visits, I can’t fault them, and among our crew we’ve sampled macchs, picollos, caps and espressos- all black or full cream milk coffees, no sugar, an espresso nazi’s dream. Maybe a soy (they use bonsoy) or skim drinker will have a different take on the place. Any criticisms I have are not related to the coffee or the food. It’s order and pay at the counter, but there’s no real way of knowing that unless you ask. This can lead to awkwardness, like when a waitress comes to take away your empty cups and plates and you ask for another coffee… Do they want you to pay now? Oh no, that’s ok. But wait, isn’t it order and pay at the counter? Confusing. Also it’s always easier to upsell and people are more likely to order more coffees when there’s a bill at the end, that’s just human nature, but at the very least it needs to be well signposted. Those two criticisms aside, this is a brand new business which is still finding its feet and barely stumbling. 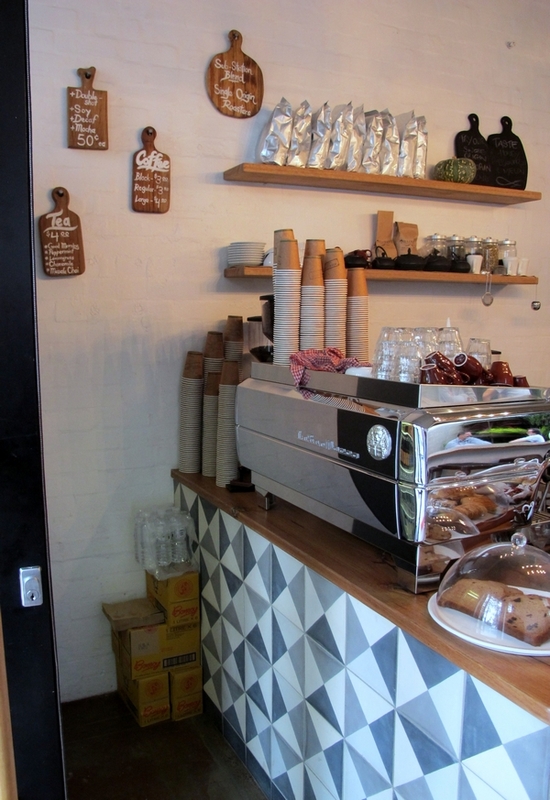 It’s run by really friendly people and housed in a gorgeous space, with a tempting but simple menu and excellent coffee. I am completely stoked to have these guys in my ‘hood. VERY VERY cool! 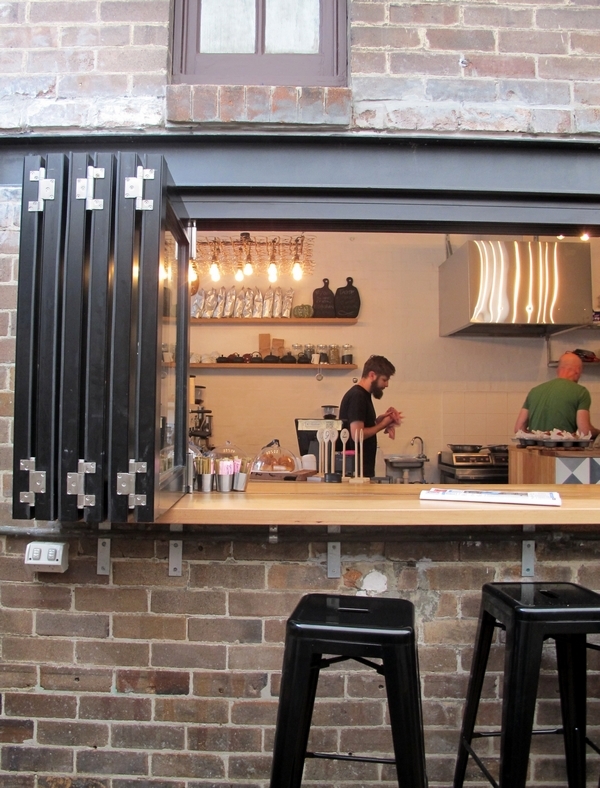 I love old sub-stations and have always thought it would be cool to convert one into a home…or cafe! Haha if by charming personality you mean awkwardly smiling at the owners and attempting jittery stilted conversations and bad jokes then I’m your man. Seriously though I’ve been very happy with the coffee and the food I’ve eaten there. It’s nice being able to order breakfasts that aren’t all stodge. I had one of their Rhubarb and Strawberry muffins which not only was picturesque but delicious.